Hockey is in my blood. My father grew up in a hockey family in Montreal, Canada, and went on to play college ice hockey at Brown University. My older brother and sister skated from a young age, and they taught me to play when I was a toddler. It’s been one of the few constants in my life ever since. Even during college when I was competing for the Dartmouth men’s lacrosse team, I played intramural ice hockey in the offseason. After college, when I moved to Boston, I joined the Boston Pride Hockey team. And I have continued to play in adult hockey leagues after moving to Los Angeles for graduate school. 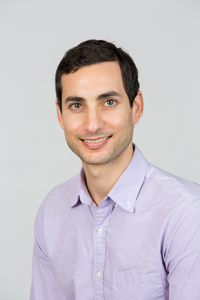 It was in LA at a gay ice hockey tournament when I first met Glenn Witman, co-founder of the You Can Play Project. Glenn was recruiting for a gay All-Star hockey team to compete in tournaments against strong competition. While playing with the G-Force Hockey team in Colorado, I first met Patrick Burke who co-founded You Can Play with Glenn and Brian Kitts. Patrick’s brother Brendan had tragically passed away shortly after coming out to a natinal audience. The Burke family wanted to get involved to further Brendan’s LGBT advocacy work and believed their connections to the NHL could help make a difference. With the tenacity and focus of athletes, the team of Patrick Burke, Glenn Witman, Brian Kitts, and a large group of individuals who just want to be part of the change, has accomplished many of the ambitious goals they set for themselves. The first of these accomplishments came in March 2012. The day after an inspiring YCP Kick-off party in New York City, I sat on a couch in an apartment in Brooklyn, surrounded by friends who are also fellow gay hockey players. 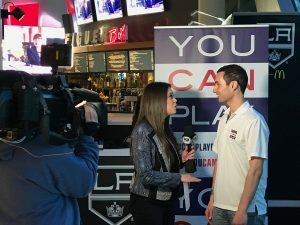 Our eyes were glued to the television, watching an NHL game on NBC, because the first video for the You Can Play Project aired between periods. The video featured NHL All-Stars proclaiming that their locker rooms were welcome to athletes who were talented enough, tough enough, and motivated enough to compete on the ice, regardless of who they are or who they love. To me, this was a profound moment, watching national television as professional athletes showed their support for athletes like us. To the YCP team, this first big victory was just the beginning. Five years later, in February 2017, NHL arenas all over North America have been covered in rainbows for You Can Play events and pride nights. I was fortunate enough to be a part of pride night with the Los Angeles Kings. 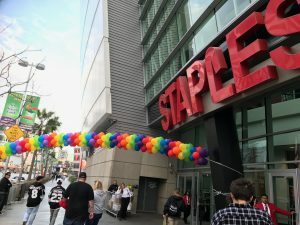 Colored balloons arranged into a giant rainbow arc welcomed us into Staples Center. Bailey, the Kings mascot, wore a special rainbow jersey as he appeared on the jumbotron from different areas of the arena throughout the night. The Kings ice crew, who cleans the ice during commercial breaks, used shovels covered in pride tape and wore rainbow shirts. In between periods, the entire ice was colored in lights from above, creating a rainbow effect 200 feet long and 85 feet wide. I arrived early with my husband Jamie and my friend and teammate Peter Bentley, to set up a booth right in front of the Figueroa Street entrance, the first thing that fans would see as they entered the arena. The booth was a collaboration between You Can Play and the Los Angeles Blades, the nation’s first openly gay and lesbian ice hockey program. The Blades handed out flyers for their upcoming Hockey Fights Hate event on April 1st, a recreational ice hockey game to raise funds to support the Trevor Project. Learn more at http://www.bladeshockey.com/hockey-fights-hate/ Next to our booth, they were auctioning off Kings players’ sticks covered with pride tape which were used during warmups. Proceeds went to support You Can Play. Pride night was an overwhelming experience. Most of us grew up in a world where being LGBT was something to be ashamed of. Thursday night, February 16th, 2017, LGBT people were celebrated. Openly gay professional soccer player Robbie Rogers performed the ceremonial pick drop before the game started. The LA Blades and the LGBT Kings Fans were featured on the jumbotron. My favorite moment was when Sgt. 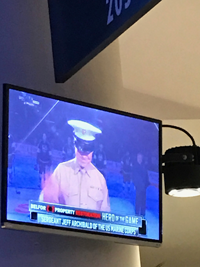 Jeff Archibald, LA Blades hockey player and active marine, was honored as Hero of the Game. Jeff and his husband are both marines who lived in fear of being found out while serving prior to the repeal of Don’t Ask Don’t Tell. On this night, 18,000 fans celebrated these courageous men for exactly who they are. It was a truly special occasion for everyone in attendance. Young Kings fans at the game got to see that it’s okay to be different, and it’s okay to cheer for two women or two men during the Kiss Cam segment. Thank you to the NHL and the You Can Play Project for making such a strong statement for players and fans. Especially in a confusing and concerning time like this, Pride night felt like a moment of sanity, progress and hope.